These fritters were not actually deep fried but baked. The mix was made of shredded zucchini, cheddar cheese, green onions and an egg white to make the mixture stick together when baking. Patties were made of the mixture were baked in the oven for about 25 minutes. 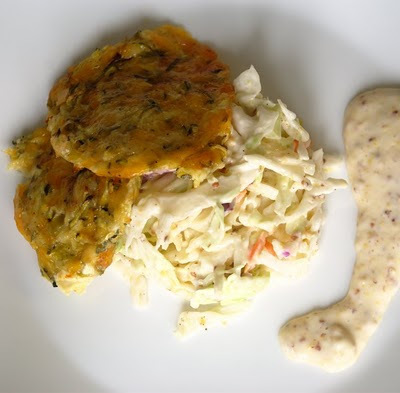 We served it over a mix of cole slaw, Dijon mustard, mayonnaise and lemon zest and juice.